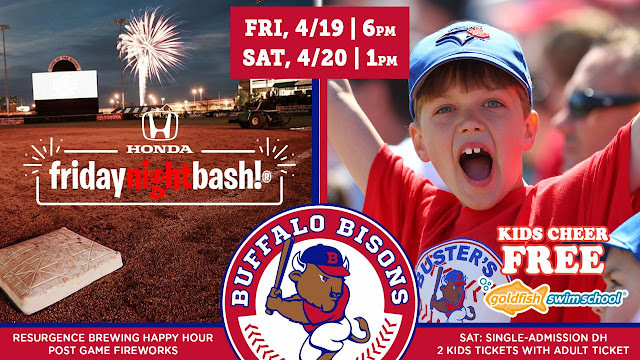 To think, we already had two amazing events planned for when the Bisons return to Sahlen Field, Friday, April 19 and Saturday, April 20, but now Vladimir Guerrero Jr. has rejoined the Herd! It's time to get back to the ballpark and celebrate the return of Spring! The top prospect in all of baseball, Guerrero Jr. has joined the Bisons on the road and the team is set to return on Friday, April 19 and will be in town for only two days until heading out on another roadtrip. If you want to see Vladdy play in Buffalo, you'll want to get to the ballpark before it's too late. And to our fans from Canada, don't forget that we are accepting Canadian cash AT-PAR this month for the purchase of single-game tickets. CLICK HERE for details. Here's what the Bisons have scheduled for the three-game in two-day homestand. It's going to be another awesome weekend at the ballpark. Top prospects, Happy Hour, Fireworks and free tickets for kids… Who's In?